❶ COMFORTABLE TO SIT ➜ The AirPuff inflatable chair is designed for comfortable seating. When you are on vacation, you spend most of your time seated. You can chat with friends, sit by a fire, tell stories or just enjoy life. Make your vacation comfortable with the AirPuff chair. ❷ LIGHT AND COMPACT ➜ Thanks to a special bag, the inflatable outdoor chair is very portable - you can hang it on your shoulder or just pick it up. AirPuff can always be with you as it takes up minimum space. Its weight is only 1,65 pounds and the size of the carrying bag is 15 by 10 inches. ❸ 30 SECONDS' READINESS ➜ The AirPuff inflatable chair is always ready for use. Thanks to its unique design, you can inflate it in just 30 seconds. You have just to open the valve wide and to fill it with air with a quick movement of 360 degrees or when walking. It is so simple. 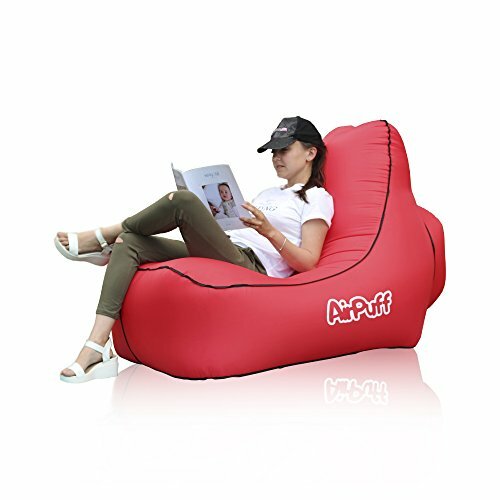 ❹ IMPROVED TECHNOLOGY ➜ AirPuff inflatable lounger is made of high quality nylon of 230T density. All connections are reinforced with special pads that prevent the material from wearing out and make AirPuff more stable. ❺ ACCESSORIES ARE INCLUDED ➜ A compact bag to carry the inflatable lazy chair is included. Besides, AirPuff is equipped with a hook to fix the chair to the ground in case of strong wind. User manual is included. If you have any questions about this product by AirPuff, contact us by completing and submitting the form below. If you are looking for a specif part number, please include it with your message.